It was 1982, and little did I know it but my world was about to be turned upside down. The days of being an only child (not the mention the only grandchild on my Dad's side) were numbered. I still distinctly remember the day when my parents sat down with me to let me know I was going to have a little brother or sister, and I was elated. 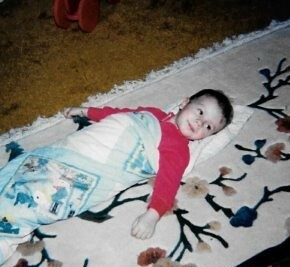 As the time for my new sibling's debut approached a lot of changes started to happen. Not only did we pack up and move to a larger house, but the room next to mine in the new house started to undergo a radical transformation. Out went the hideous 1960s shag carpet and in came the makings of a nursery. The theme my parents chose for the room was Beatrix Potter, and my mom ran with it with gusto. My parents installed a stained chair rail and above it hung a themed wall paper adorned with the covers of many children's tales. And while they may have deviated a bit from the Peter Rabbit theme, my Mom added many personal touches like this cross stitched piece for the room. My Aunt Susan got in on the action and sewed a beautiful Peter Rabbit quilt, which would later be known as "Gankie" and would secure its place as my brother's prized possession for many years. 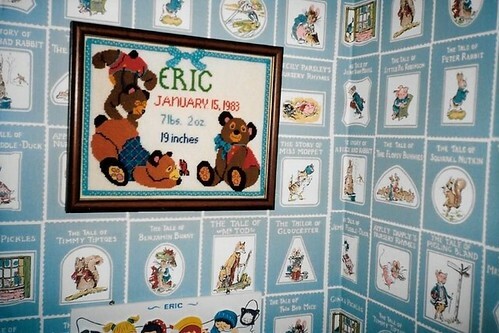 While adorable and charming, there was no way to argue that this was anything but a baby's room. The colors, accessories, wall paper, and even the Humpty Dumpty lamp all played into a room fit for a youngster. It served its purpose for many years, but as my brother turned into a toddler and eventually a "big boy," I remember his exclamation many times that the room was fit for a baby, and he wasn't a baby any longer. It seems this approach to decorating children's rooms has changed over the years. As more and more of our friends prepare for their impending bundles of joy, I'm seeing the trend of creating sophisticated multipurpose spaces with childlike elements layered in. Instead of nursery characters decorating walls from top to bottom, I'm seeing a design foundation that includes chic paint colors, clean lined furniture that could be found in any adult space, and a mix of decor and accessories that can work for many ages. One of my favorite nurseries of late belongs to Jonah, one of the cutest one year olds I know. 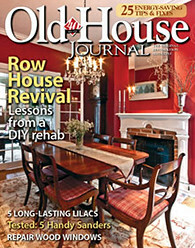 His mom, a blog reader, contacted me a few months back to see if I could meet with her and her husband to talk about putting their beautiful Old Town condo on the market. The room actually pulls double duty as the couple's home office and Jonah's room. It's bright, spacious, and offers two large windows at one end. Here's a look from the other side of the room. 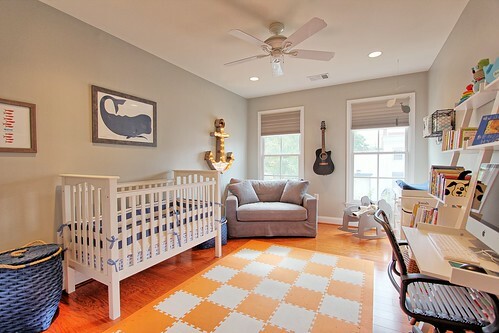 The room is painted a beautiful shade of gray, Dolphin Fin by Behr, which acts as a rich neutral base for its blue, white and orange accents. 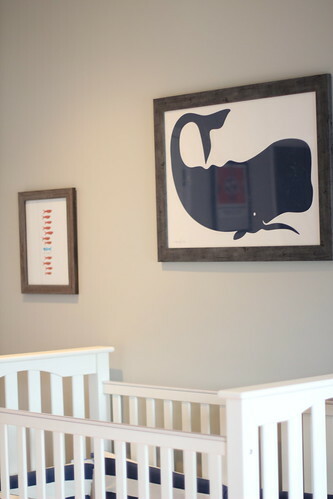 One of my favorite pieces in the room is this whale print above the crib, picked up from one of our favorite local home decor stores, Red Barn Mercantile. You'll see whales sprinkled throughout the room, a perfect choice given their son's name. 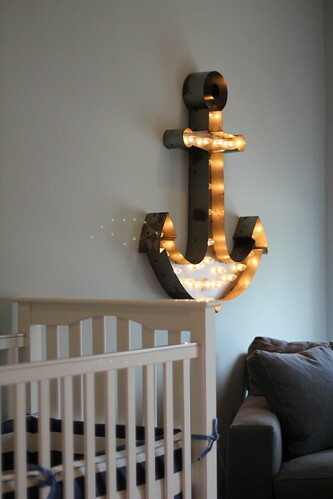 Keeping with the nautical aspect of the room's theme, the couple hung a lighted metal anchor also purchased from Red Barn Mercantile. 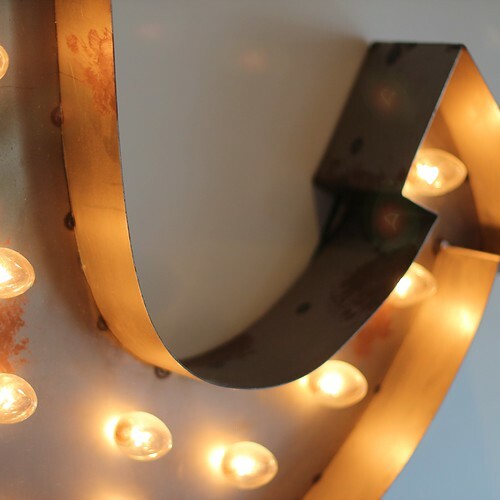 This great 3D piece adds a tremendous amount of texture to the room's feel and throws a very warm light from its many clear classic bulbs. 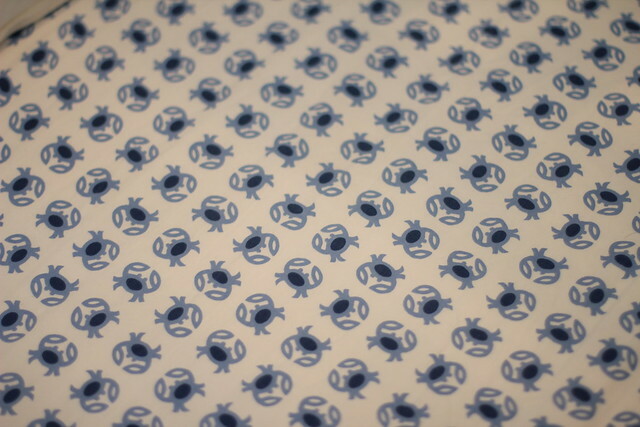 Also from the sea, Jonah's crib bedding gives a nod to the area's rich seafood legacy with lots of adorable little blue crabs. 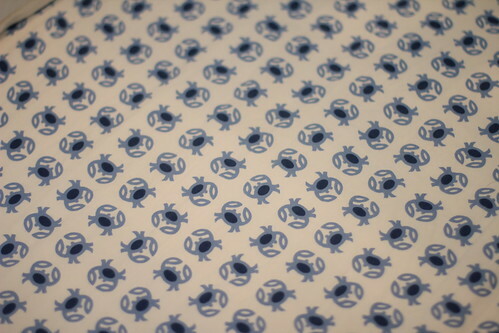 I love this bedding and think the crabs are simply too cute. The small scale of the pattern reads as very sophisticated and pairs perfectly with the wide blue and white bumper pattern. 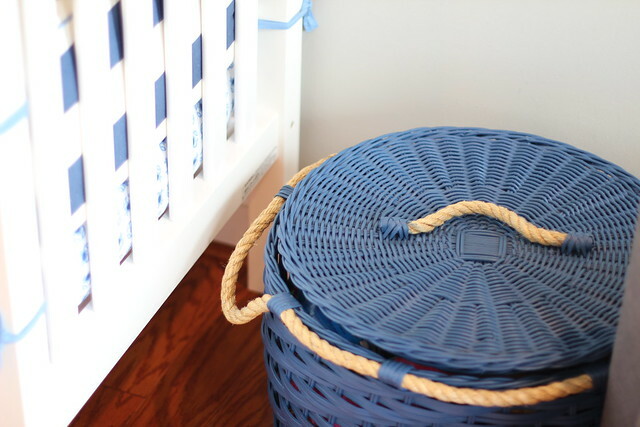 On either side of the crib they've paced two blue wicker toy baskets adorned with manila rope to carry the nautical theme even further. In my opinion, no nursery is complete without great mobile that draws the child's focus, first in wonderment, and later as a just out of reach achievement they're always trying to pull down (just ask Alex what happened to the little planes that flew above his crib). 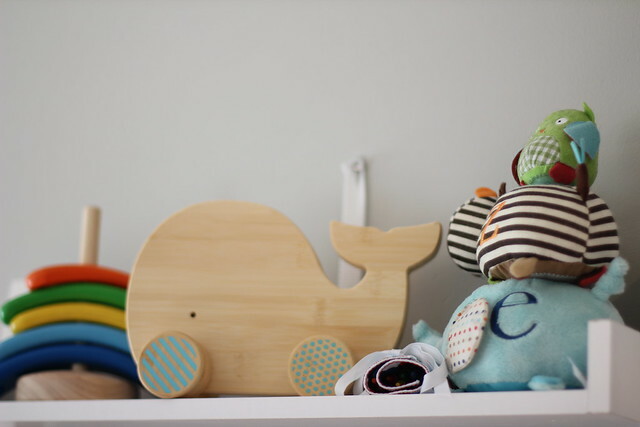 In this case, Jonah's three toned smiling whales play endlessly with each other above his changing station. To soften the hard wood floors in the room, they've placed a durable, cushioned and vibrantly colored checkerboard play mat of interlocking squares throughout the center of the room to act as Jonah's play area. Here they can all roll around and play with any toys they'd like without worry of their impact on the wood floors or little one's knees. But when this room is no longer a nursery, the squares can be easily taken up and tucked away. 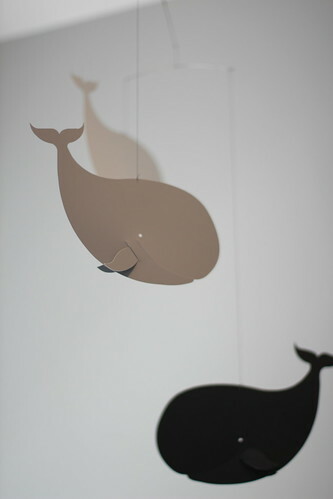 ...and additional whale friends and toys. 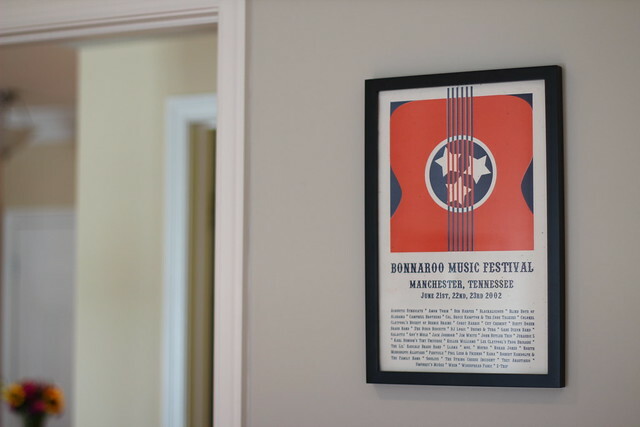 The room also includes a couple subtle nods to music. 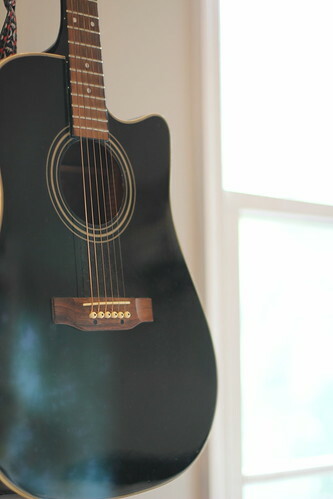 Jonah's Dad is an avid guitar player, and you'll find his guitar hung on the wall just waiting for the day that Jonah is big enough that they can start playing together. There's also a brightly colored music festival print that works with the room's color palette. I think it's obvious why I love this room so much. 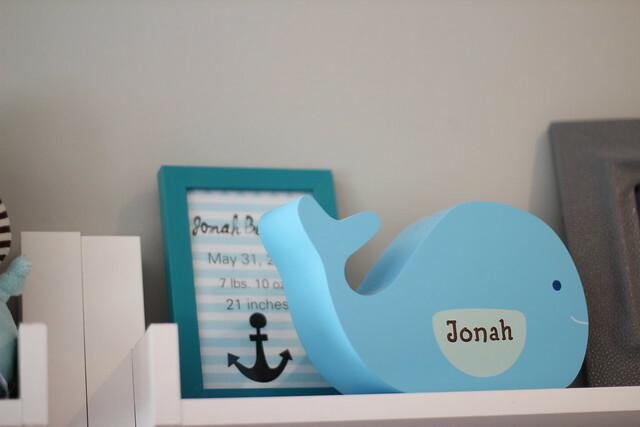 It's bright, spacious, and includes adult-friendly colors, styles and lines while introducing a perfect blend of whimsical and personal touches that celebrate Jonah for who he is now, and will easily grow with him over time. To see how the rest of their home is decorated, you can view the photos in the real estate listing online. Great post! We have a little one ourselves and will definitely use some of your ideas! I'm sure Jonah's mom will be thrilled to hear that! I think it's super cute! Glad you like it too! 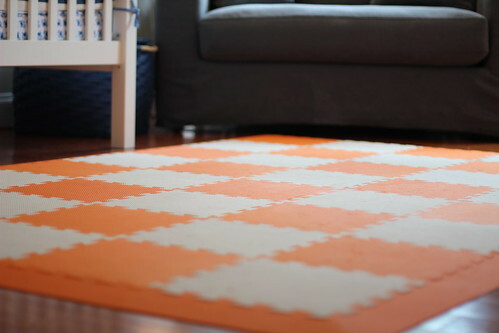 It is a great room as it works for a baby but isn't cutesie, and I like the play mat a lot. But are you trying to tell us something about upcoming changes in your family?? Haha, no. Just appreciating good design and nice decor when I see it. What a great idea, Jan! Thanks for sharing. It's amazing how quickly and dramatically styles change over time. I can't help but wonder what people 30 years from now will think of our early 2000s' style.